Measuring the performance of Mississippi students, and by extension, their schools and school districts, is a complex task. That task has been complicated in recent years by annual changes in assessments (MCT2, MCT3/PARCC, MAP), and a complete overhaul of academic standards (Mississippi’s standards now are more rigorous than two-thirds of all states). The Mississippi Department of Education (MDE) reports that no further changes are planned for standards or assessments in the foreseeable future, which means teachers and students can expect consistency for the first time in several years. The first year of any comprehensive statewide assessment typically is considered a baseline year, with the understanding that an accurate comparison of test data cannot be made until the second year of data from the same assessment is available. That comparison data will be produced by the Spring 2017 administration of MAP. The 2015-2016 school year provides the baseline data for MAP. It was administered in Spring 2016 to students in grades 3-8 math and English language arts, and high school level Algebra I and English II. See school and district test results. The performance of students on assessments is reported as a scale score, which then is assigned a performance level of Minimal, Basic, Passing, Proficient, or Advanced. See MDE’s explanation of these terms. The performance levels are determined by a cut score, which is set by the State Board of Education. There is a degree of subjectivity in this cut score determination. 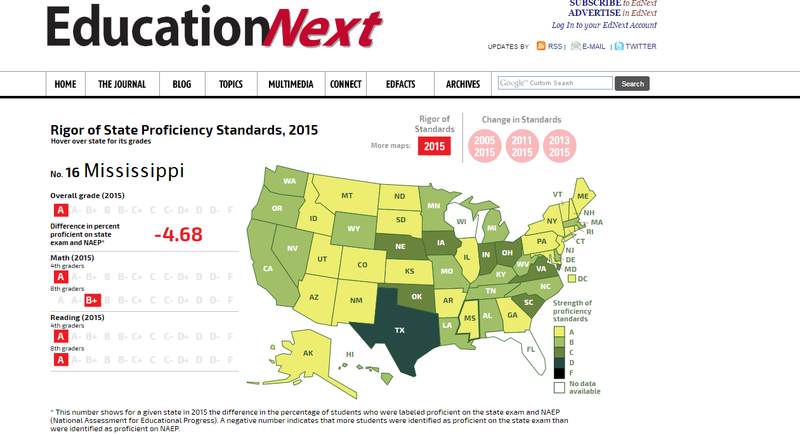 According to national norms, if students nationwide were to be measured according to Mississippi’s system, only 31 percent would likely be considered proficient in third-grade reading. The student proficiency measures noted above have a significant impact on school and district ratings, but several other components, when combined, have a greater bearing on ratings. Schools are scored on a point system of up to 700 points for schools without a 12th grade and up to 1,000 points for schools with a 12th grade. Points are earned for student proficiency rates in math, English language arts, and science; student achievement growth in math and English language arts, with an emphasis on growth by the lowest performing students; and additionally for schools with a 12th grade, proficiency rate in U.S. History; graduation rate; college- and career-readiness in math and English language arts; and participation/performance in Advanced Placement courses. See our chart explaining the growth component. A school’s total points are measured on a scale to determine an A, B, C, D, or F rating. The scale adopted today by the State Board of Education would result in schools and districts at or above the 90th percentile (meaning 90 percent of schools or districts score below them) receiving an A rating and those below the 14th percentile receiving an F rating. The school and district ratings based on this new scale will be announced in October.